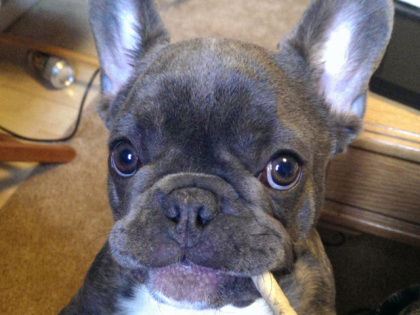 When Mojo and Pudge, two French bulldogs owned by Danny Schwartz of Pittsburgh, PA, were let out into the back yard of his duplex on the 2nd of May and then seemingly disappeared, he thought they got out of the yard and walked away. “Originally, we just thought they were lost. We went out and printed flyers,” Schwatrz said. He was in no way ready for what would happen next. On Saturday, Schwartz was contacted by a man on a private phone number. The man claimed to have Mojo, and said he paid someone in the Mount Oliver area $250 for the dog. When the man had asked about French bulldogs going for around $2000, Schwartz became even more concerned, and that’s when he contacted the police. Schwartz did end up agreeing to give the man $500 to get Mojo back safely. They met at a Giant Eagle (gas station and convenience mart) on Wharton Street, in the South Side of Pittsburgh, with police watching. “That’s when he told me that he knew the guy with Pudge and he lived right up the street from him and he could talk to him for an extra $50,” according to Schwartz. That is where police stepped in. The man that had Mojo and claimed to know of the whereabouts of Pudge was taken in for questioning, and was driven to the area he claimed to have bought Mojo from. Pudge was nowhere to be seen. Schwatrz is now concerned that Pudge could be hurt, or has been sold to someone else and will never be returned. This is horrible! Give him Pudge back you rotten low lifes! What has this world come to? People stealing dogs out of the safety of their homes and extorting money from owners? Disgusting! They need to punish them severely.